Cryptocurrency market on Wednesday added approximately $6 billion to its overall valuation. The top 25 coins, including bitcoin and ethereum, trended in green during the Asian session. But the biggest takeaway was EOS, a blockchain protocol asset, which posted maximum daily gains among the top ten crypto assets after rising 11.92%. During the European session, EOS/USD established a fresh weekly high towards 4.18, its best since February 25. The pair noted a small correction as the session matured, dropping 1.43% by the time of this writing. At the same time, the volume recorded during the past 24 hours was close to $2.764 billion across multiple cryptocurrency exchanges. Late yesterday, Weiss Crypto Ratings, a division of Weiss Ratings LLC, launched a comprehensive report on emerging trends in cryptocurrency and blockchain markets. The agency awarded crypto projects with grades based on the likelihood of their short and long-term success. EOS received the position of second-best blockchain project for its technology and adoption, as well as for its high-grade risk-reward profile. Soon after the Weiss published its grade, EOS price started climbing. The cryptocurrency formed a big green candle during an hourly session between 0000 UTC and 0100 UTC and maintained its profitable scenario throughout the sessions that followed. The ongoing EOS rally could fade anytime soon, given that traders would want to squeeze out their session profits. Fundamentally, an extended rally depends on investors who entered the EOS market today with a long-term strategy. Providing the rally was too sudden, it could fall back in an equal fashion. Then, there is a particular market scenario at play. Let’s have a look at the Binance chart below to understand it further. On a session-to-session basis, the EOS/USD pair could correct lower upon testing a stiff resistance level. The pair is currently trending inside an ascending channel. 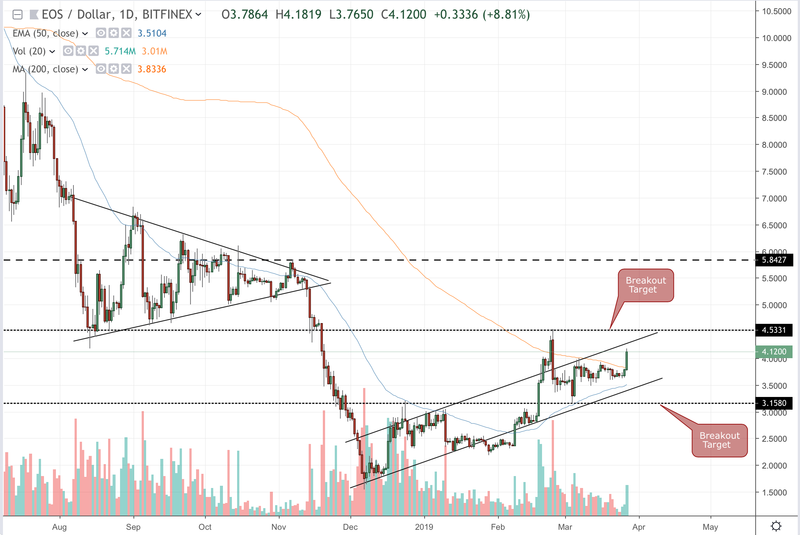 It is now moving upwards towards the channel resistance, which has a recent history of capping EOS’ upside attempts. There is a likelihood that the asset would repeat its price action once it touches the resistance level. Traders could exit long positions near it, thus causing a bearish correction. There is also a possibility of a breakout action (upside movement coupled with a rise in volume). If it happens, then traders could shift their long targets towards $4.53, the peak level from February 24 trading session. Therefore, the probability of EOS extending its rally would be more if it stays above the channel resistance trendline. In long-term, EOS is still inside a downtrend. Ascending channels are technically short-term bullish indicators, which means they generally resume the trend that took place before their formation. In EOS case, the previous trend was bearish. So, unless the asset breaks crucial resistance levels, such as the one at $5.84, its likelihood of resuming a downward trend is enormous. The post EOS Price Trending in Green Following 11.92% Surge – Can It Rise More? appeared first on NewsBTC.